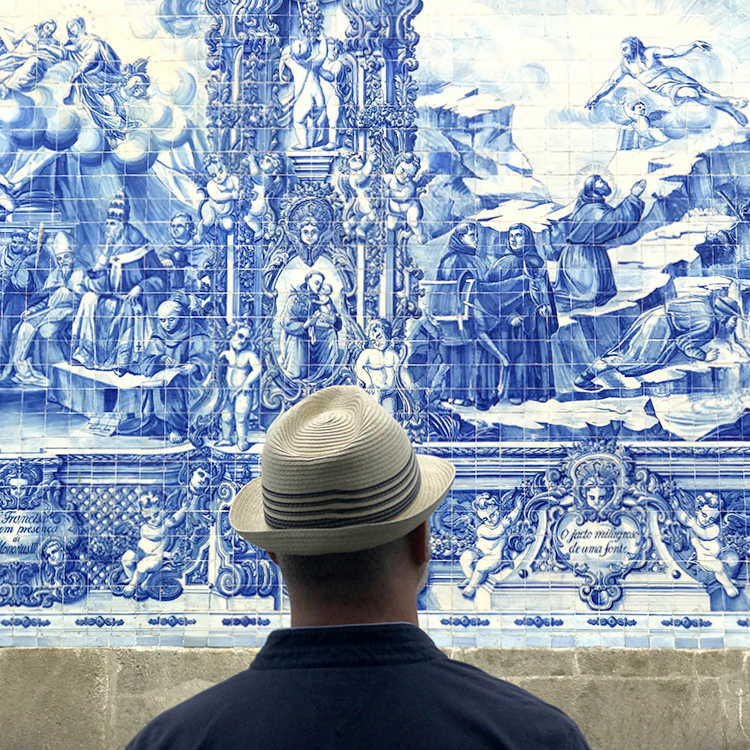 Porto has been one of our most favourite city breaks ever! 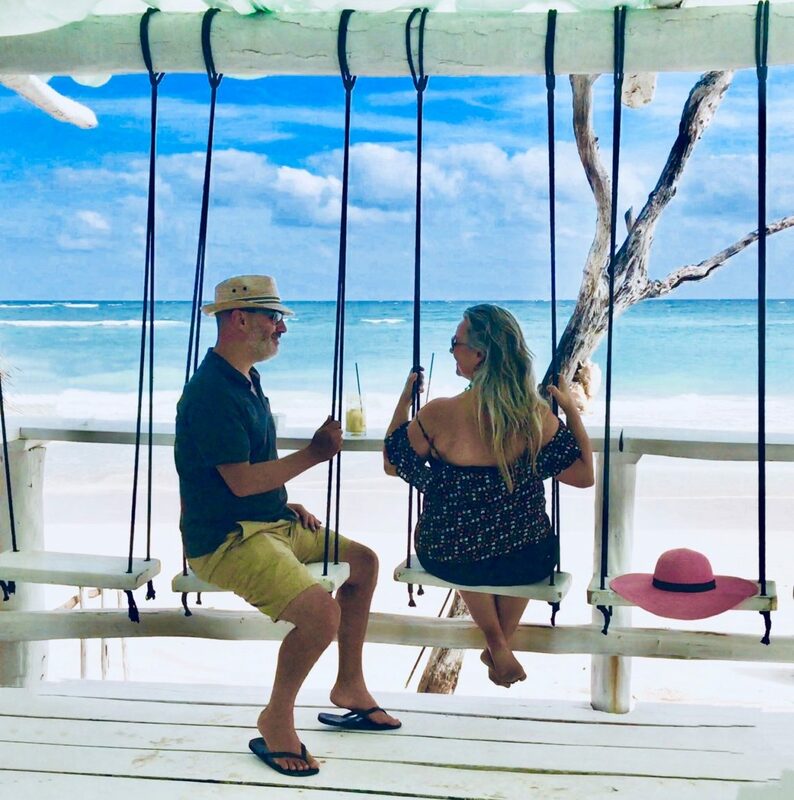 We knew there was lots to see, do and eat but the atmosphere bowled us over – it was so much fun!! And for such a compact area it has so much to offer in a quirky, exciting and unusual way! 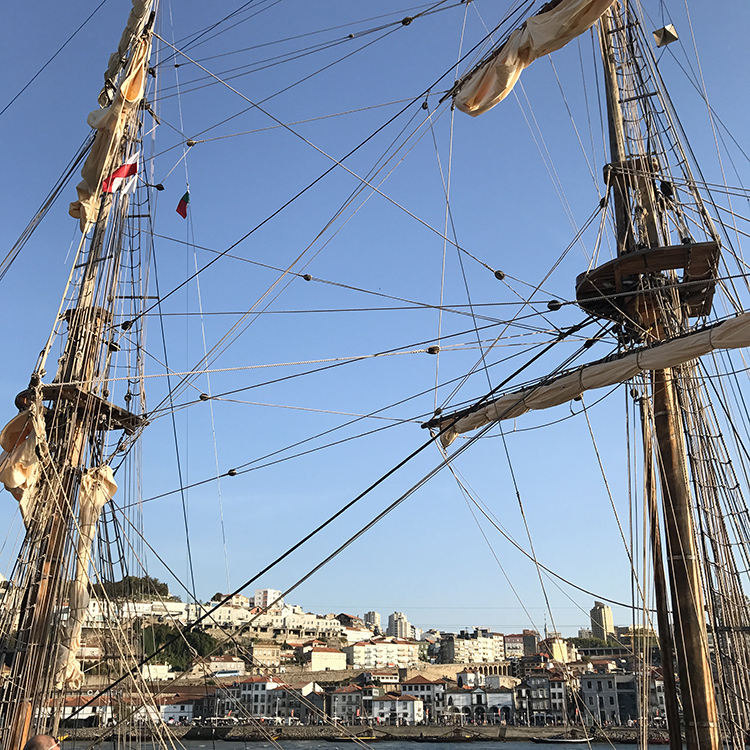 Firstly, the central point being the busy river Douro which works wonderfully … with a multitude of fantastic eateries and bars on both sides of the water generating a wonderful atmosphere! 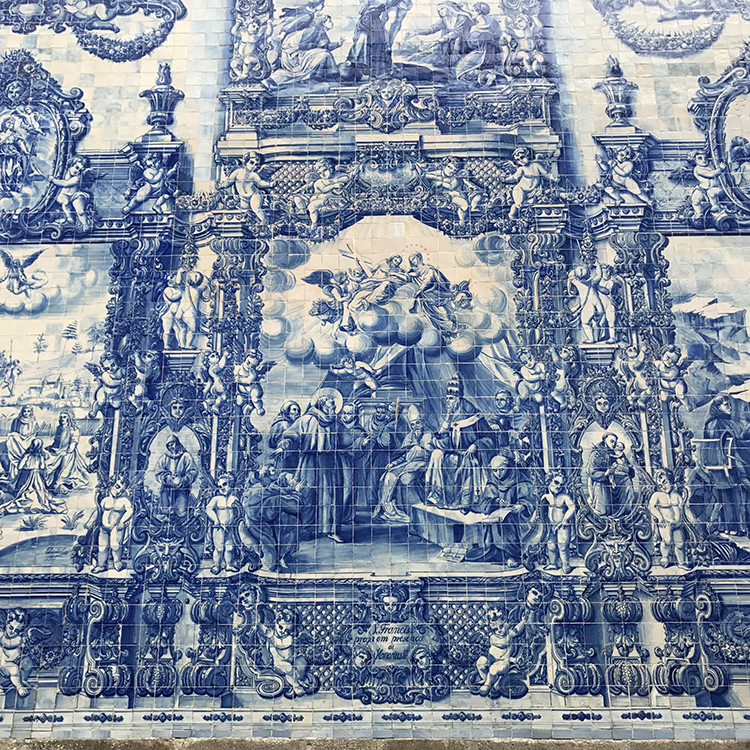 It is so close – one side Porto to the other side Gaia – that you can hear and clearly see what is going on over the water which is unusual and really quite brilliant!! Water taxis go back and forth between the two sides continuously and then there are the lively tour boats of all shapes and sizes sailing up and down adding to the vibrant hustle and bustle. 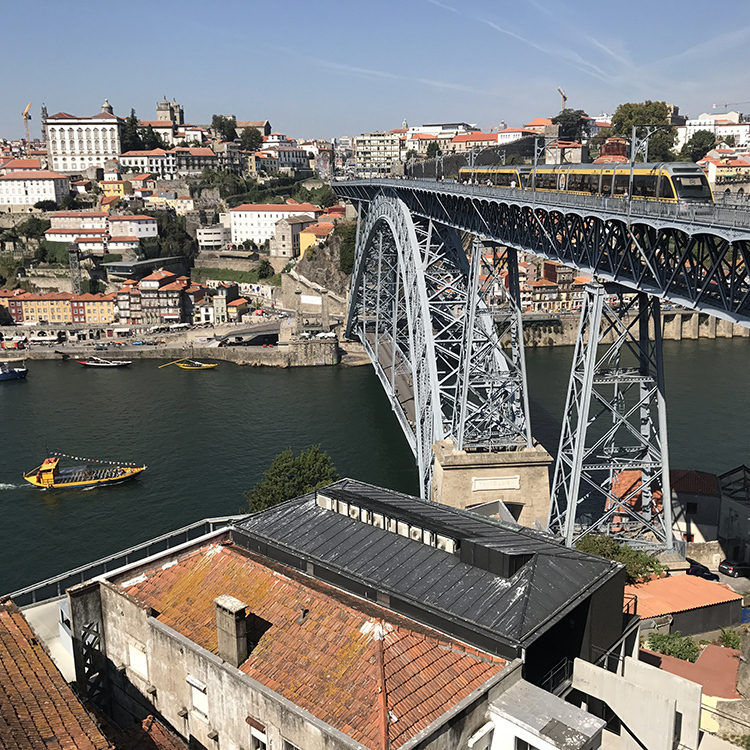 Porto’s streets are steep and ascend sharply from the river which makes for the extraordinary double decked Dom Luis metal bridge – a sight to behold, imposing on the skyline, with both levels worth walking across. The lower level is busy and noisy with traffic plus local youngsters shouting for tips before diving from the structure into the river – which had it’s heart stopping moments!! The higher level is a bit calmer with the odd quiet tram gliding across it – also being so high up the noises below are somewhat muffled. Needless to say the views are spectacular down the river in both directions! Another added element to all that is going on in this area is that you don’t have to climb the vertical roads to see the top of Porto or the bridge! 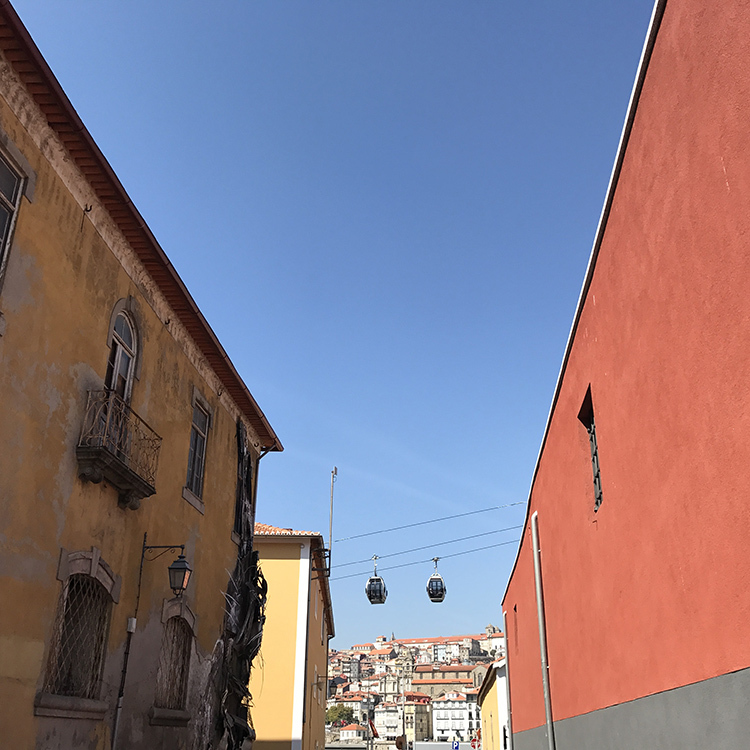 There is a quick cable car running overhead on the Gaia side of the river that will quickly transport you up top, giving yet another view point over the pretty city! 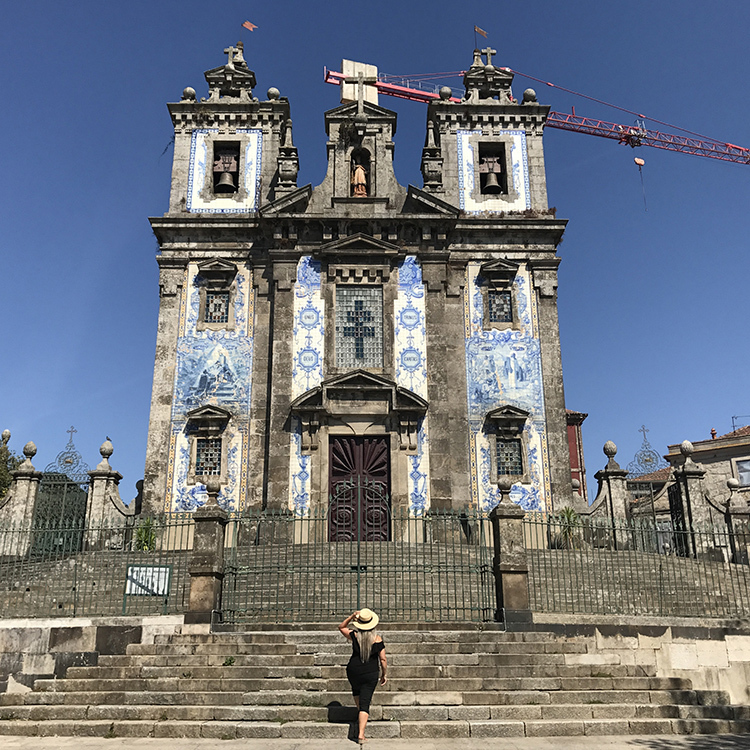 And that climb, however you choose to get up there, is well worth it as the streets, architecture, churches and the famous tiled facades are so very beautiful. We also found the shops, bars and restaurants to be very quirky, modern and vibrant with a different feel about them to the riverside, which kept things interesting! And if you like sardines you are in the perfect place as there are whole shops literally dedicated to them! For Port lovers you are in for a real treat! 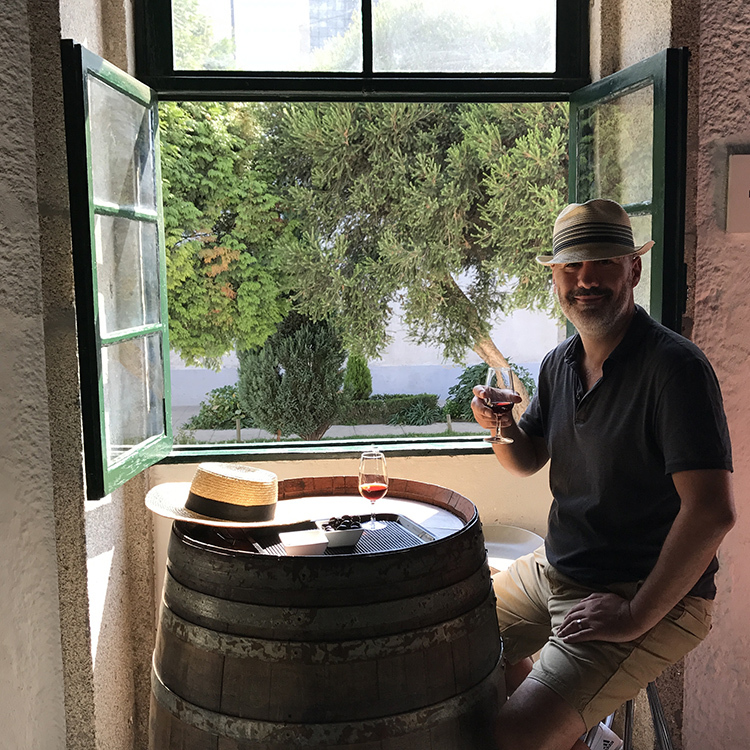 Over the river in Gaia you will find the very best internationally famous cellars where you can go for a tour or simply just sit and taste – a really fun, relaxing and interesting area to say the least! 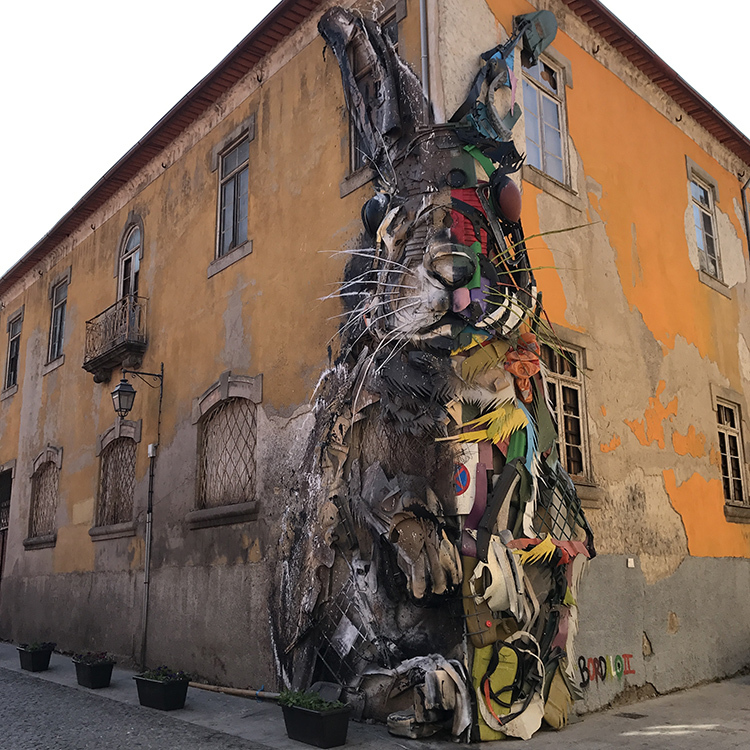 Gaia also felt like the more trendy, creative area of things with wonderful street art and contemporary interiors set amongst the old warehouses which made for a fascinating wander around. 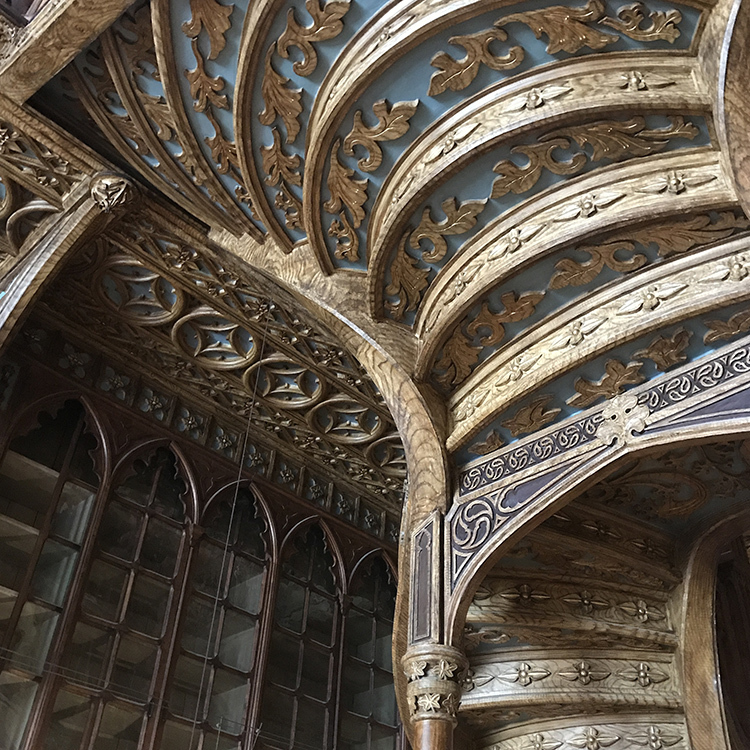 In stark contrast the incredible Livraria Lello (Library/Bookstore) back in Porto can’t be missed – the relentless queues down the street to get in proving so! 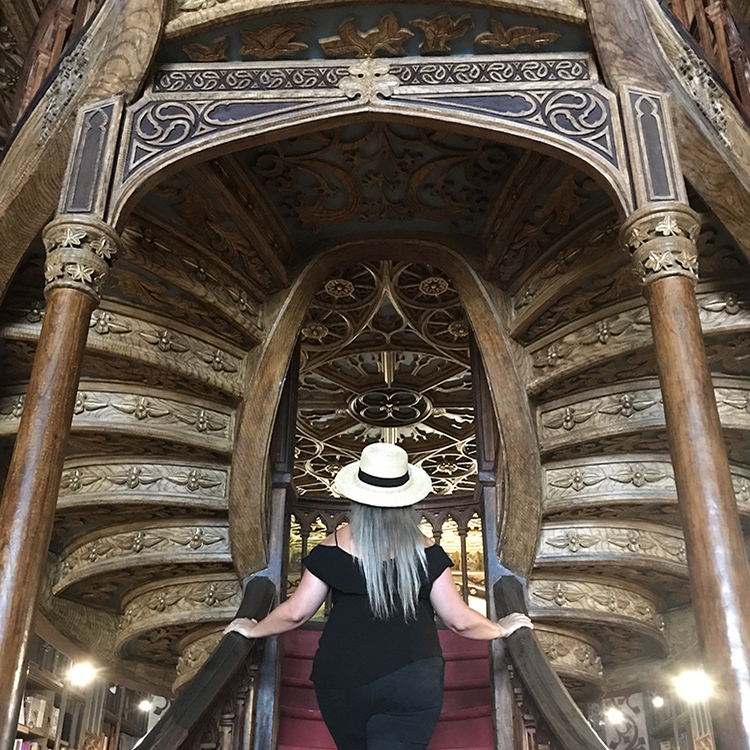 Worth a look as the famous wood carved staircase is stunning – in fact the whole interior, on two levels, is amazing … just a shame that it is continuously packed with people! 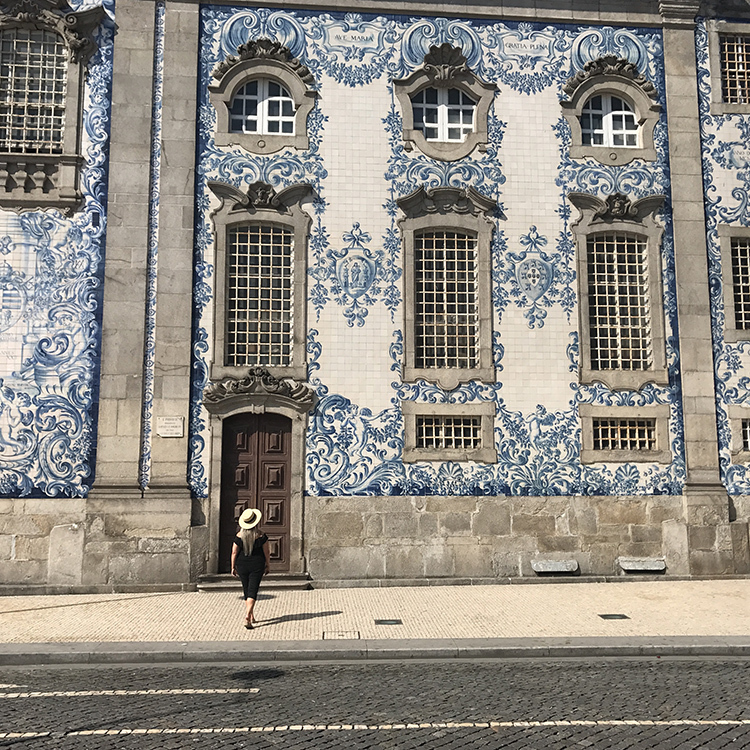 All in all we couldn’t fault Porto and would go back in a heart beat as it really does deliver as the perfect city break with so much to see and do … we definitely need to explore it some more!